Back in 2011, Dan Perpich was somewhat shocked to find rows of wilted lettuce in the local grocery store, retailing for $18 a head. He was visiting Resolute Bay, a town of 130 individuals in northern Canada. Yet he really wasn’t that shocked, because he knew many rural communities in Alaska had exactly the same situation, due to the challenges of local production, a severe lack of skilled labor and support industries, and highly seasonal weather patterns. So this West Point graduate and commodities trader decided to do something about it: he founded Vertical Harvest Hydroponics. The company’s vision is to make produce in the north be as fresh, crisp and as healthy as possible, grown on-site and year-round. Strategizing with his dream team, Cameron Willingham and Linda Janes, the trio came up with a 40-foot insulated shipping container with a hydroponic growing system, designed especially for Arctic environments. Because produce can be grown within the container, produce can actually be grown anywhere — at least where there is power and access to water. The system is deemed to eliminate the need for a long supply chain. That is key for a state where agriculture was less than 1 percent of the gross state product in 2012 and 14 percent of Alaskan households are considered food insecure. In addition, according to a 2014 report commissioned by the Alaska Department of Health and Social Services in collaboration with the Alaska Food Policy Council, 95 percent of the food that Alaskans purchase is imported. That amounts to $2 billion dollars spent on food brought in from the Lower 48 and other countries. Clayton Jones of Eagle River, a chef with eyes on owning his own mobile restaurant one day, can personally attest to the quality of the hydroponic produce, explaining that each vegetable he has used to cook with has been top notch, featuring a vibrant, clear flavor. “It all comes down to flavor,” he insisted, noting that the easiest way to make better meals is to obtain better ingredients. “Seeing more fresh produce in more people’s hands, it works well for me because people eat better, and they expect better and I get to do a little more than just hash and eggs,” he said. Kyle Belleque, owner of Belleque’s Family Farm in Dillingham, was even more enthusiastic. “It’s the difference between a crème brulee and a ding dong,” he said. 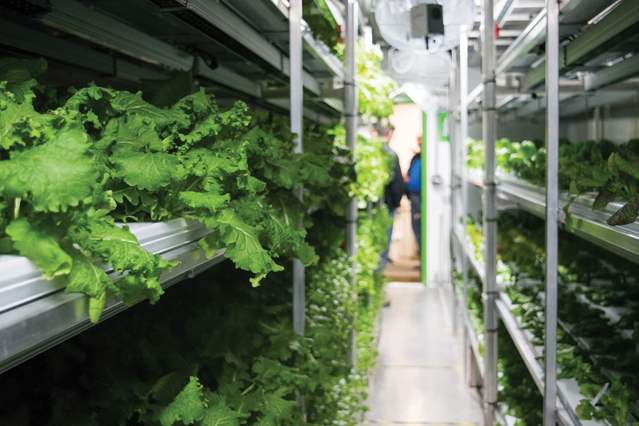 His farm installed a Vertical Harvest system and immediately realized the difference between the hydroponic vegetables and products which have been shipped from the Lower 48. Transported produce has been cut, dipped in chemicals, frozen on the tarmac and arrives looking bad and tasting bad, he said. In contrast, what Belleque now grows is “fresher than fresh” and surprising to many customers when they bite into the lettuce and actually taste flavor. Belleque’s services the Dillingham school district, the AC Value Center and just started delivering to the area’s local hospital. Plans are being considered to provide produce to nearby villages as well. It’s also more nutritious and healthy than produce which has died somewhere in the procurement process, he said. And customers who take home live produce can keep it going for several additional weeks. Each turnkey container is designed to be modular, to keep it as repairable as possible, and as simple as possible for the customer who does not have to be a horticulturalist or obtain specialized training to run the system. Customers can choose from a large variety of herbs and greens, from mint, parsley and basil to butterhead and romaine, kale and arugula. Seeds are placed in racks inside a growroom, with 1,800 separate slots available. A control room automates the nutrients needed, circulates water, controls the LED lighting and maintains the HVAC. Seven days after planting, a seedling blooms, growing bigger by three weeks in, and ready for market by week six. A 40-foot container can produce up to 39,000 plants per year for commercial scale schedules and consistency in quality. Vertical Harvest estimates that one system can support roughly 1,000 individuals yearly. However, projections are difficult because of the breadth of products that can be grown in one system which may or may not meet the demands of traditional Alaskan native foods. Containers are currently located in Dillingham and Kotzebue, as well as several locations in Anchorage. “You have probably eaten some of this product,” Perpich said. Breaking through various obstacles to market over the last several years, Vertical Harvest is now a mature player in an immature industry. As of now, there are not a lot of players. However, Perpich anticipates that there will be, followed by private equity buying up and consolidating the competition within five years. Recently, Vertical Harvest was one of four finalists in the American Farm Bureau Foundation’s 2017 Rural Entrepreneurship Challenge. The company competed with other companies from around the country for a share of start-up funds. If 2016 is any indication, more good news is on the way for Vertical Harvest, and rural communities around the state.